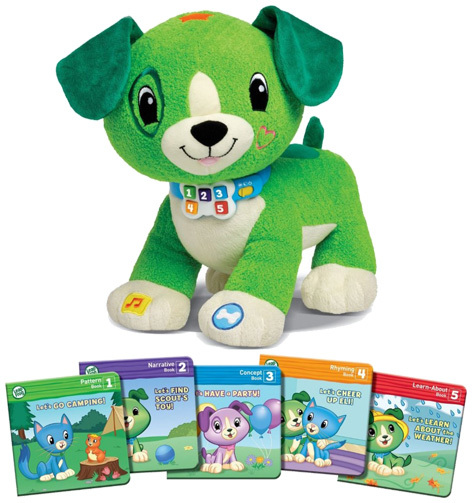 With appealing faces and gorgeous soft plush bodies, Read With Me Scout and his female companion Read With Me Violet are two of the best electronic learning products from LeapFrog. Designed for kids aged 2–5 years old, these toys provide the perfect impetus for helping children master the most important reading skills. Comprehension is encouraged with an inbuilt selection of over 70 questions that also feature interactive answers from Read With Me Scout. Five story books are included with both toys, and each one helps to turn bedtime storytelling into a fun and rewarding experience. Scout and Violet have collar buttons that perform different operations, as well as a few inbuilt body sensors such as patting the head when it’s time to turn a page. When kids are feeling sleepy they can just listen to soothing lullabies or just have a story reads to them. Nothing will ever replace story time with Mum or Dad, although Read With Me Scout and Violet both add interesting dimensions to the important ‘learning to read’ lessons. Please tell us what you think of Read With Me Scout by LeapFrog.